This spring, my absolute favorite pair of casual shoes, ecco brand mary janes in orange and beige, broke. I tried to find the style again, but since I’ve been wearing them for more than 3 yrs now, they are no longer available. As a replacement, I got myself a pair of purple Keens. I then decided I needed socks to go in the Keens. Short socks. Since I’ve purchased entirely too much opal at a very cheap price, I decided to use that. 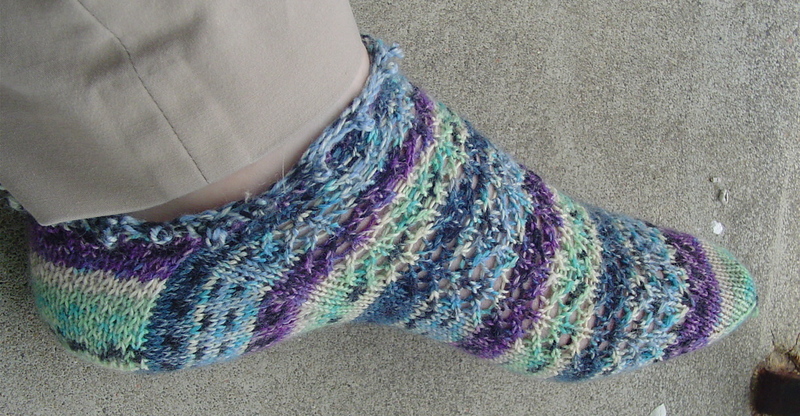 Now, I can get two pairs of short socks out of one skein of opal. Meaning that the grand total for a pair of socks in this case is less than $4. If you know anything at all about sock knitting, you know this is truly dirt cheap. I chose the ‘Vog on pattern, and have been knitting at work. Slow going, but productive.